My parents don’t rave about many 1980s movies. For starters, the Venn diagram representing their film tastes doesn’t overlap much. While my mom can give you a scene-by-scene recap of Dirty Dancing, my dad is busy quoting Back to the Future. They also became parents during the early 80s, meaning they missed out on a lot of 80s classics. For example, my mom watched The Princess Bride for the first time just months ago, and I’m also reasonably sure my dad has never seen a single Molly Ringwald film. They also generally dislike most movies from the decade. Mom can’t stand Ferris Bueller, and Dad once described Indiana Jones as “kind of silly” (a statement I still cannot comprehend). So it’s kind of odd that Highlander– of all movies– is not only something they have seen, but a film that they both love. It’s perplexing, and yet makes perfect sense. I was dubious the first time my parents put on Highlander. They both got super excited when they found the DVD at Wal-Mart (this was back when it was still difficult to find older movies on DVD), and spent the car ride home talking about something called “the quickening” and periodically stretching out their arms and yelling “I know everything!” It was… weird. I had also been burned before by their odd movie choices, and I was not keen to be duped again (They once found a VHS for 1981’s Excalibur, which they had watched on HBO and loved, only to discover that it was no where near as good as they remembered). But then I watched it and actually really liked it. It’s a B-movie for sure, but a great B-movie. My parents were definitely drawn to this film because of the Scottish hero and setting. My dad is a Scotsman by name (though several generations removed from the highlands), and my mom has readily adopted our ancestral culture. Highlander has all the kilts and bagpipes and sword fighting of Braveheart, without being bogged down by history or Mel Gibson’s Oscar aspirations. It’s just a lot of fun, which is always a plus. I for one love the idea of immortals roaming the planet. It’s a close enough cousin to the time travel genre, lending itself to some great scenes showing the lead trying to fit in and keep a low profile through the centuries. This is also an action movie that never feels like it’s taking itself too seriously, sprinkling a lot of humor throughout the story. About the only bad thing I can say about this film is that someone thought it made sense to cast Sean Connery as an Egyptian/Spanish dude. It’s a tad distracting hearing Connery say that he’s never heard of haggis in what is clearly a Scottish brogue. However, it’s also hilarious, so maybe he was cast precisely because it would be funny. Besides, Queen wrote several songs for the soundtrack so that pretty much makes up for any other deficiencies. Highlander is a whole lot of fun. What’s not to like? A bunch of immortals globe trot around the world cutting each other’s heads off before a champion is crowned. My biggest criticism is the casting. Whoever thought it was a good idea to cast the best known Scotsman on earth as a Spaniard that trains a Scottish highlander how to cut heads off needs their head checked. It is almost laughable to hear Connery questioning his protégé Connor MacLeod (Christopher Lambert) about the delicacy that is haggis. As if the audience is expected to believe he hasn’t been eating it his whole life. He also makes no attempt to hide his Scottish accent, which just adds to the confusion of him supposedly being a Spanish person. Highlander starts off in 1980s New York where Connor MacLeod is an antiques dealer specialising in swords, this might sound unrealistic, but nearly ever museum I went to in America has had an entire section devoted to weapons, so I’m sure someone like this would actually exist and be in demand. But I digress, Connor is one of the few remaining immortals left in the world. He discovered he was immortal during a battle against a warring clan during the middle ages. Connor has travelled the globe ever since seeking out other immortals and lopping their heads off, which is the only way to kill an immortal. Connor is looking out for one such immortal that murdered his mentor (Connery), named Kurgan (Clancy Brown). As luck would have it, he happens to be the last remaining immortal other than Connor, so whichever one kills the other will also win this undisclosed tournament that has been on for thousands of years. The plot sounds too complex, and it probably is a little bit. This film is really just an excuse to have great sword fighting set pieces, which it does have. The fight scenes are fun, Lambert is a bit prickly as a leading man, but the man has been alive for thousands of years, he must be over life by now. I’ve only been around for 30 years, and even I can’t handle it sometimes. You definitely like him more than Kurgan, who is just evil. His fight scene with Connery is great. Highlander does a good job of switching timelines. One scene you are in present day New York and the next, middle ages Scotland. The film does a really good job of switching back and forth, similar to how Godfather: Part 2 did. 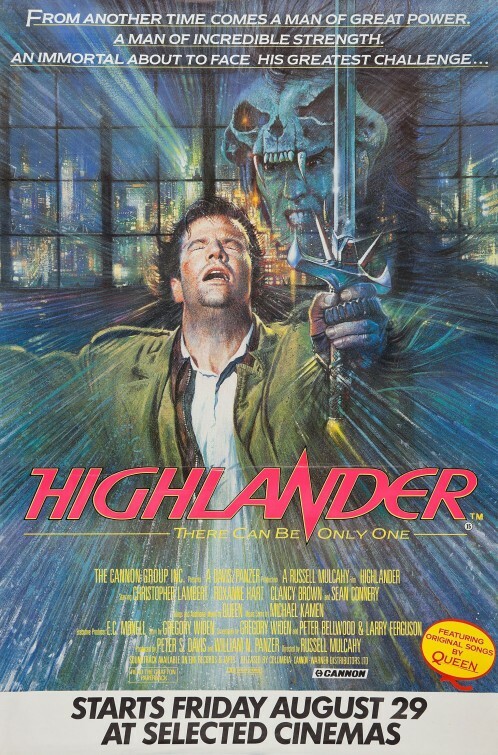 Highlander has become a cult classic now, spawning many sequels, and even a television show. The idea of immortals secretly fighting each other across the globe is a fun one and still holds up today. There was talk of remaking this film with Ryan Reynolds in the lead not long ago. While I don’t agree with that casting choice at all, I can see how this is a story that would still resonate with audiences today and would definitely be excited to see an updated version of this film. Biggest disappointment for me was that they made a sequel which was horrible. So horrible I can’t remember much about it. Which is actually a good thing! Oh yeah. I forgot to mention that I think Ricardo Montalban would have been a much better choice than Sean Connery!